Kancheepuram is not only known for its presence of numerous Hindu temples like Vishnu temples and Shiva temples but also prevalent are the religion like Buddhism and Jainism which are as old as Hinduism in Kancheepuram. Kancheepuram can be divided into Shiva Kanchi, Vishnu Kanchi, Buddha Kanchi and Jain Kanchi. Janisim flourished and spread in Kancheepuram in the Pallava reign, which is evident from the fact that most of the Pallava kings were Jains themselves. Two of the best known ancient Acharyas, Akalanka and Samantabhadra were associated with Kanchi. There are two Jain temples surviving at present in Tiruparuttikunram, on the banks of the River Palar, near Kancheepuram. One is a temple is Chandraprabha Temple dedicated to the eighth Tirthankara, Chandraprabha. It is believed that the Pallava king Nandivarman Pallavamalla built it in the 9th century AD. The other temple adjacent to the first one is Trailokyanatha temple dedicated to Lord Mahavira. As of now both these temples are looked after by the Tamil Nadu Archeology department due to their highly deteriorated state and are closed now for general public. Chandraprabha Temple is located in the Tirupparuthikkundram Village near the Kanchipuram Collectorate along the road leading to this village. This temple was constructed to worship the Eighth Tirthankara Chandra Prabhu Swami. Chandraprabha Temple was built by the Pallava king Narasimha Varman II in the 8th century. The temple is open for visitors from 08:00 am to 11:00 am, due to its deteriorated state the temple is not open for longer hours and also puja is not conducted. According to the Jain legend, Chandraprabha Swami was an incarnation of God in Anuttar Vijay dimension. Chandraprabha Swami was born to King Mahasen Raja and Queen Lakshmana Devi of the Ikshvaku clan. It is said that once Queen Lakshmana during her pregnancy had a strange desire to drink the streak of glow from moon while watching the full moon for long time. Later when she gave birth to Chandraprabha he was so fair that he was glowing like a moon. Chandraprabha, unlike other princes, was much into the pleasures and whims and fancies of the kingdom. He became ascetic in very young age and gave him all the pleasures of life, after three months of rigorous spiritual practices he became omniscient. The rest of his life he went on to preach and enlighten the masses with his vast ocean like knowledge and spread Jainism all over the world. During the end of his life he went to Sammetshikhar and after a month long fast and meditation he attained Nirvana and became a liberated soul. Chandraprabha temple was built during the Pallava reign hence it carries the Pallava style but during the course of time it has deteriorated and due to this many repairs and renovations have been made to the temple so much so that the temple has lost much of its Pallava style architecture and now it is more or less exhibiting the modern style. The temple is neither too big nor too small. There is shrine and a small mandapam in front of the temple. The shrine was later closed for public view. The first floor was made a shrine and it houses the image of Tirthankara Chandra Prabha. There is a mythical figure at the cardinals of the shrine called as Yali who has a head of lion tusks of an elephant and the tail of a serpent. Trilokya Natha Jinaswamy Temple is located in the Tirupparuthikkundram village in the outskirts of Kanchipuram township. Trilokya Natha Jinaswamy Temple was built during the time of the Pallava king Kulothungan I in 11th century and the temple was gradually expanded later during the Cholas and Vijaynagar rulers. The deity presiding in this temple are Mahavirar, Pushpa Danthar and Dharma Devi. The temple is open from 08:00 am to 11:00 am and 04:00 pm to 06:00 pm. Trilokya Natha Jinaswamy Temple is a combination of two groups of sanctum sanctorum. Each group has three sanctum sanctorums. The first group is called the Trilokya Nathar Temple and the second group is called Trikooda Basti. Trilokya Nathar Temple is consists of idols of Mahavira (twenty fourth Tirthankarar), Pushpa Danthar (ninth Tirthankarar) and Dharma Devi. The second group consists of idols of Padma Prabha (sixth Tirthankarar), Vasupujyar (twelfth Tirthankarar) and Parshvanathar (twenty thirdTirthankarar). The groups have separate mandapam viz. Ardha Mandapam and Mukha Mandapam. The only common mandapam between the two groups are Maha Mandapam, Bali Peetam and Mana Sthambam. Apart from the mandapam there is also a gopuram which has three floors, a separate space for five monks and a warehouse to store grains. The gopuram is at the eastern entrance of the temple. The temple consisting of the idol of Lord Mahavira is the oldest one built during the reign of Pallava King Simha Varman. The temples was initially built of bricks by the Pallavas but it deteriorated with time, later the Cholas and the Vijaynagar rulers re-built it using granite foundation and sandstone. The Vijaynagar rulers built a 61 feet long mandapam which has 24 pillars and is famously called as Sangeetha Mandapam'. 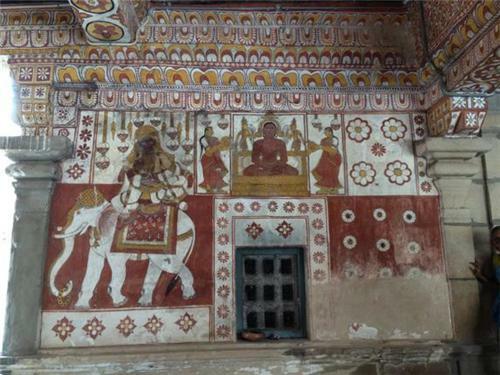 and Dharma Devi, other paintings such as Little Krishna lifting the Govardhana hill, killing the snake Kalinga, elephant Asura and Kamsa can be seen. Train: Nearest Railway station is Kanchipuram which is at a 5km distance from the temple. From the station taxi, auto or tagna (horse pulled vehicle) is available. Some of the trains passing through the Kancheepuram station are Arakkonam-Chengalpattu Pass, Tirupati-Nagercoil Exp., Arakkonam-Melmaruvathur Pass., Kanchipuram-Chennai Beach Passr, Lokmanya Tilak (T)-Madurai Exp. Etc. Road: By road the temples are located at a distance of 76 km from Chennai, 35 km from Chingleput & 64 km from Mahabalipuram via Chingleput and 15 km to the south of central Kanchipuram. Airways: The nearest Airport is at Chennai, The Chennai International Airport. Vandalur - Anna Zooligal Park is largest in South Asia and is at a distance of 60 km from the place. Vedantangal - It is a Bird Sanctuary well known for attracting Birds from far away places like "The Artic" and is at a distance of 35 km from the temples. Is there any bhavlingi digambar muni near Kanchipuram, if yes please inform me.